Judging by the Cover – 11/14/18 new releases – AiPT! Eric and Trevor share their favorite covers from the week’s new comics. Uncanny X-Men #1 has a million different covers, but this one is my favorite. Dekal manages to incorporate ten (ten!) characters into a single image while keeping the overall look streamlined instead of crowded, and they’re all attention-grabbing. Nightcrawler’s ominous expression is a highlight, as are Jean’s eyes gazing right at the reader. The composition is also very strong in the way that each character leads the eye along. You have Bishop looking up, the curve of X-23’s arm leading one’s gaze toward Jean who is in turn within Storm’s cape, and at the top there’s Cannonball blasting right into the logo. Cool stuff all around. I dig the action and the colors here. The way the shattered glass splays out conveys breakage and danger but there’s still a sense of elegance, matched well by Selina’s pose as she leaps in midair. The pink background also pops well against the black and light blue of the foreground. You know an artist is good when they can convey so much with such a simple, static image. We all know what’s reaching up out of that egg, but the fact that we can’t see it in its entirety still adds to the sense of horror. It’s like that moment where you know there’s something terrifying behind you but you have yet to actually turn around and see it. The choice not to include any sort of scenery in the background also works. It prevents the reader’s eye from latching onto anything except that promised moment of terror at the cover’s center. The fade from blue to black is lovely to boot. This cover is so effective because it pulls focus to one of the most dreadful sights in the Alien franchise, second only to a fully grown Xenomorph. It evokes the original cover art from the first Alien film while giving the viewer a big “Uh-oh” feeling at the sight of those Facehugger legs creeping out of the fleshy egg. Christmas adds a lot of little lines to convey texture and give the egg an extra icky feeling. A cover that does a lot with very little. Continuing the less-is-more theme of my picks, Mitch Gerads brings in a Looney Tunes reference alongside the series’ recurring “Darkseid is” panel. Evoking Daffy Duck in the same space as the series’ signal for s--t about to go down is very on-brand for a series that blends humor and dread. The cover is also on brand for writer Tom King who earned a ton of praise for his Batman/Elmer Fudd one-shot. A fitting cover for the end of an affecting series. Jen Bartel expressed a lot of my feelings best with her tweet revealing the cover. 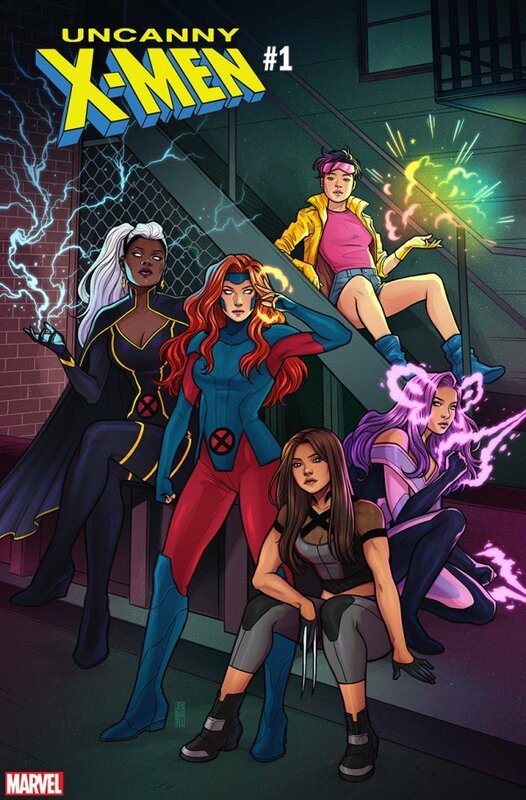 No shade at the other variant artists for Uncanny #1, but I love Bartel not only doing a cover that isn’t the same line-up as Cover A, but that celebrates some of the women of X-Men looking ready to mess someone up. I especially love how Ororo’s lighting is rendered here, with the little flecks of light blue for the sparks. This is the variant I’m hoping to grab when the issue comes out!